I attended a “Hamptons-Style” White Party on Saturday night, with the byline, wear your summer whites while you still can. And it got me thinking, is the “wearing white after Labor Day” rule still relevant? White has become a popular fashion fixture and we are seeing a lot of white dresses, white pants, white skirts and white sweaters all year round. What are these worn with? Are they really meant for year-round wear? White blouses have always been a fashion staple, and years ago my grandmother gave me the advice to wear a white blouse when meeting a future beau’s family. This presumably was due to white’s “pure and innocent” reputation. What about all white after Labor Day? And what about white pieces at other times during the year? Here are my suggestions for wearing white after summer ends. If you are wearing white in the fall or winter, I do not suggest wearing it from head to toe; mix it with black, or another neutral. Black and white provides a strong contrast and can build your visual presence. Pure white is not the right color for everyone. Many find that ivory is more flattering to their complexion than white. Ivory, when worn with any other color, will resemble pure white to others. Textured white or ivory is more interesting than plain solid white. You can find white on white patterned tunics and dresses. Ivory (of which winter-white is one version) is being shown for fall in textured wool jackets and corduroy style pants. 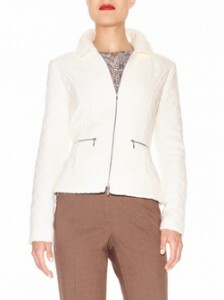 White, ivory and tan jeans can be worn anytime during the year, and look interesting with a dark top or jacket. Shoes with your white outfit can be tricky, and I do not recommend matching shoes to your white outfit. Instead show off a tan, black or blue shade. Just make sure your other accessories such as jewelry and pocketbook blend in as well. Don’t forget that your complexion may be darker in the summer, so the same light shades that flatter you in the warmer months, may make you appear even paler in the winter. This is why I recommend ivory or winter-white rather than the pure version. Nothing looks worse than a white outfit with a stain or scuff mark. Check yourself front and back for dirt or creases on your light colored garments before wearing them. And remember to dry clean all lights and whites before storing them for the winter. Not all stains are apparent immediately, and it’s disappointing to try on an outfit in the springonly to realize that a permanent stain has set in over the winter. If you want to go all out and wear white during the winter, go ahead! Rules are made to be broken, as many a fashionista knows. 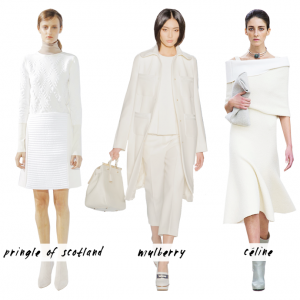 Here are some ways that current designers interpreted all white for winter.